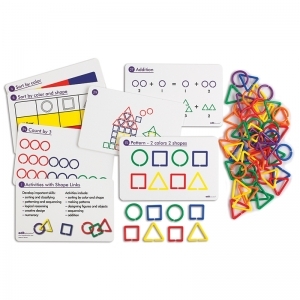 This Math Manipulatives Activity Kit includes 150 magnetic pieces and 26 reproducible activities. 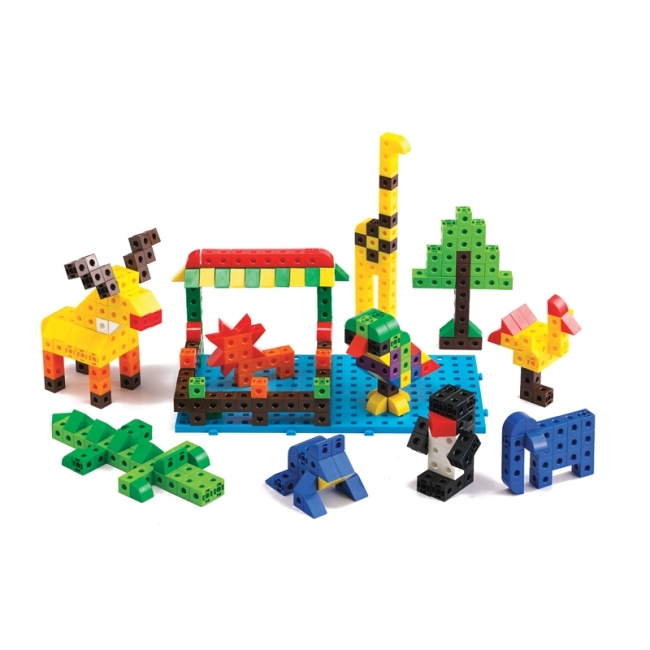 Use the 108 magnetic pattern block pieces to teach spatial relationships and simple geometry. The 42 tangram pieces (six tangram puzzles) are a great, hands-on resource for teaching mathematical reasoning and problem-solving skills. 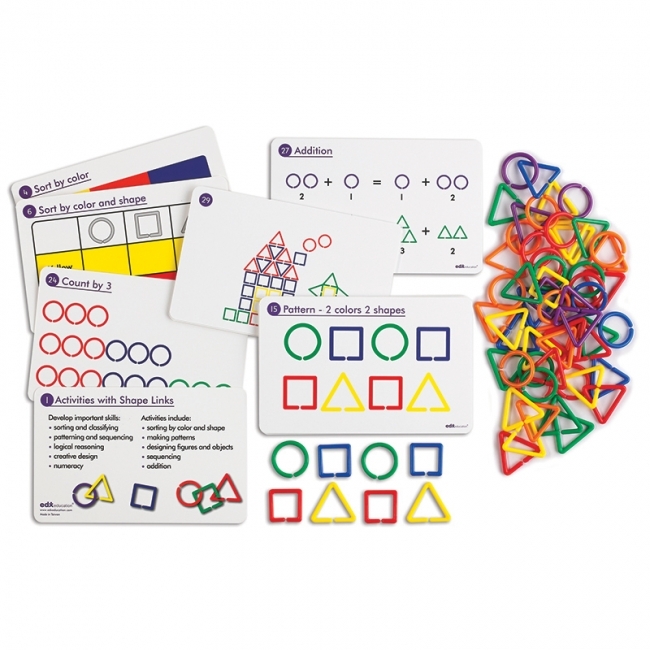 Because these math manipulatives are magnetic, your student's elaborate patterns and puzzles will stay in place! 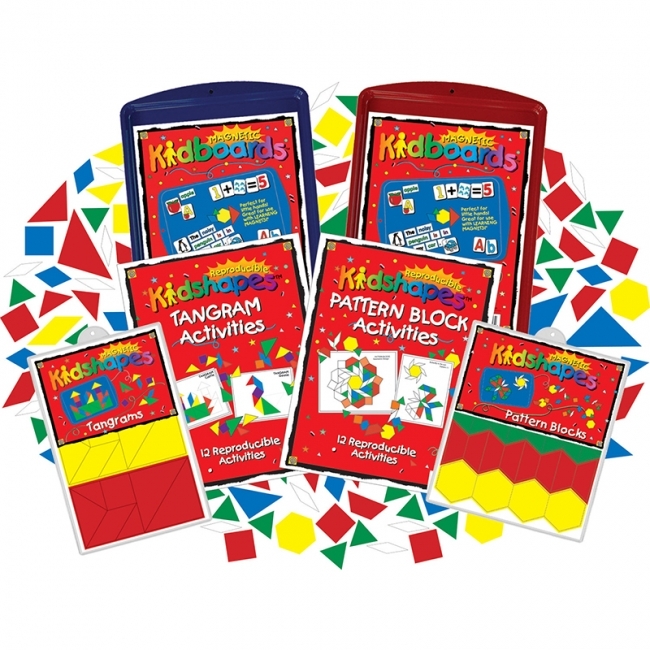 The kit also includes a companion activity book for both sets of math magnets and two magnetic-receptive Kidboards™. This is a fabulous kit for classroom, home and travel! 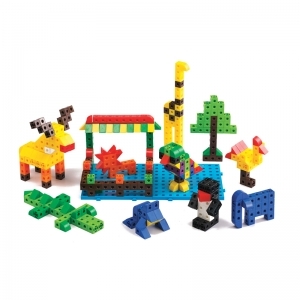 The educational aim of this product is to stimulate participation in creative construction, sorting, counting, basic operations and problem solving activities. Develop important skills in color and pattern recognition; spatial relationships; logical reasoning; numeracy. Activities include making shapes, recognizing and building patterns, basic numeracy, and symmetry. The creative possibilities are endless with this monster pack. Designed to be virtually unbreakable, these blocks will easily meet the rigors of the classroom. 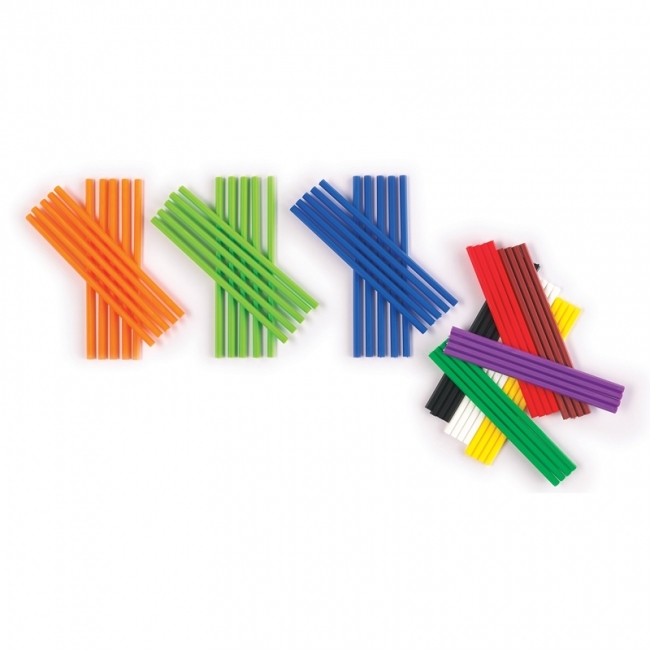 One set includes 500 blocks in 10 bright colors, comprising 400 cubes, 50 triangles, 50 quadrants, 4 base boards and 20 2-sided activity cards. Block measures 2cm square, in sturdy plastic container. 10cm, 10 colors, 1000pcs Each stick measures 3mm dia. x 10cm long. A great way to develop children's skill in counting, sorting, addition, subtraction and measuring. In sturdy plastic container. Build attribute chains in three shapes and six colors with this giant 360 piece set of links in 3 shapes, 6 colors and 20 double-sided activity cards in a sturdy container. Great for counting and sorting activities too! Allows for children to strengthen their building, counting, and sorting skills. Students will easily grasp various number concepts because they can see the results! Display number relationships of equal to (=), greater than (>), or less than (<). This balance makes learning number concepts easier because students can see the results. This is a self-checking balance that can display a variety of concepts such as greater than, less than, equal to, and basic operation skills. 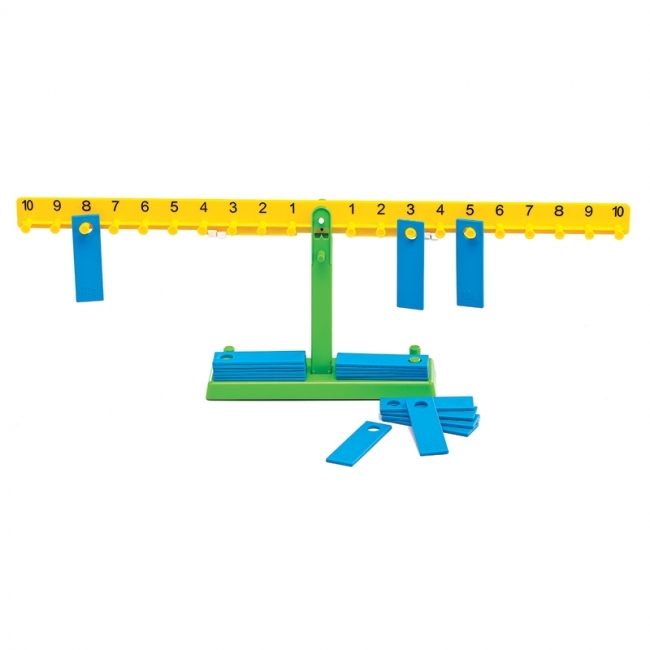 Demonstration-Sized Math Balance measures 25.59" W x 8.66" high and comes with twenty 10g weights. The hands-on way to visualize numbers and operations! These easy-to-manipulate discs provide hands-on practice for developing number sense. Color-coded according to place value, the foam discs allow students to visually track what happens when they regroup numbers in both addition and subtraction. And they help illustrate that multiplication is the same as repeated addition, and division the same as repeated subtraction. Packaged in re-sealable poly bag for easy storage. 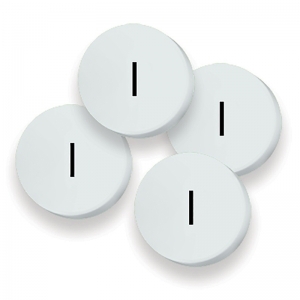 Discs are 1" in diameter, 1/8" thick, and made of EVA foam for easy manipulation and quiet classroom activity. 25 each of 4 values - 0.001, 0.01, 0.1 and 1. 100 total discs in set. The hands-on way to visualize numbers and operations! These easy-to-manipulate discs provide hands-on practice for developing number sense. 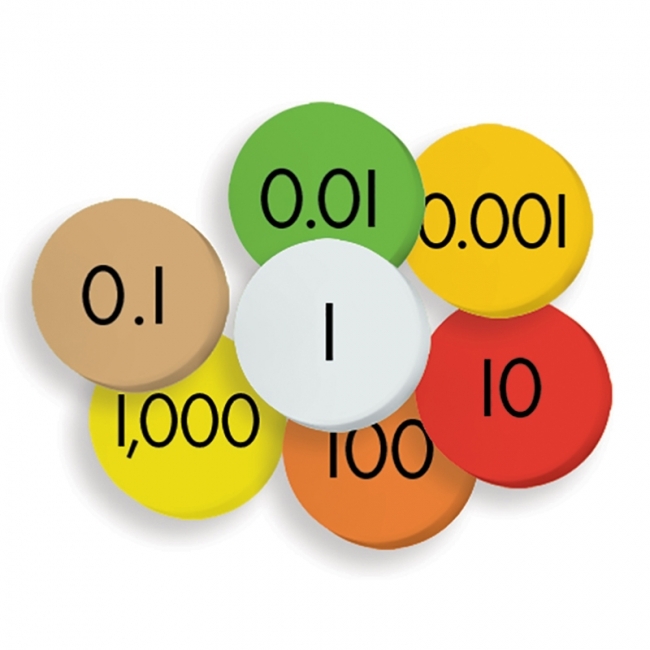 Color-coded according to place value, the foam discs allow students to visually track what happens when they regroup numbers in both addition and subtraction. And they help illustrate that multiplication is the same as repeated addition, and division the same as repeated subtraction. Packaged in re-sealable poly bag for easy storage. Discs are 1" in diameter, 1/8" thick, and made of EVA foam for easy manipulation and quiet classroom activity. 25 each of 4 values - 1, 10, 100, 1,000. 100 total discs in set. The hands-on way to visualize numbers and operations! 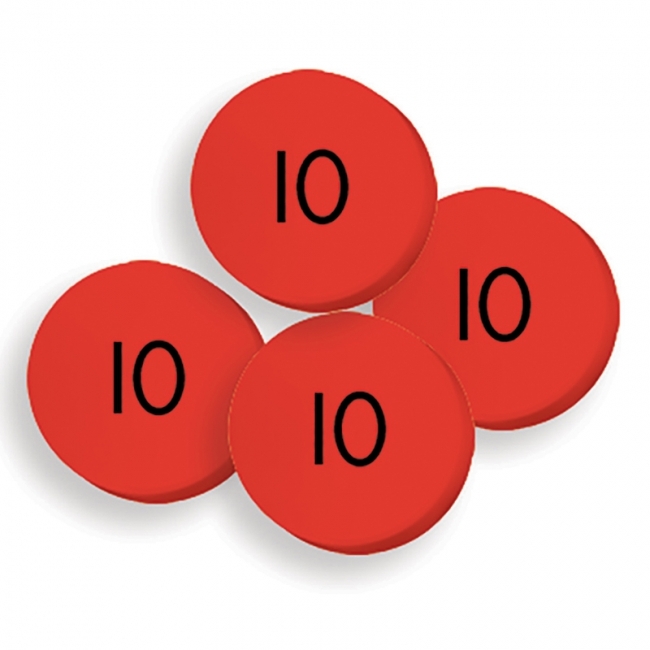 These easy-to-manipulate discs provide hands-on practice for developing number sense. 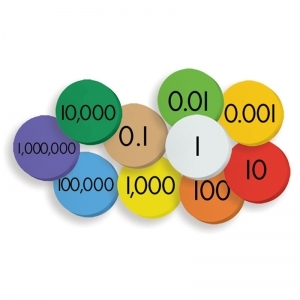 Color-coded according to place value, the foam discs allow students to visually track what happens when they regroup numbers in both addition and subtraction. And they help illustrate that multiplication is the same as repeated addition, and division the same as repeated subtraction. Packaged in re-sealable poly bag for easy storage. Discs are 1" in diameter, 1/8" thick, and made of EVA foam for easy manipulation and quiet classroom activity. 25 each of 7 values - 0.001, 0.01, 0.1, 1, 10, 100, 1,000. 175 total discs in set. The hands-on way to visualize numbers and operations! 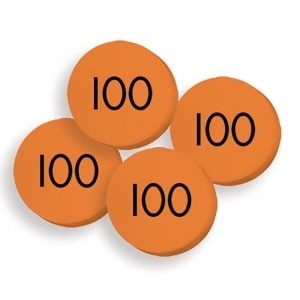 These easy-to-manipulate discs provide hands-on practice for developing number sense. Color-coded according to place value, the foam discs allow students to visually track what happens when they regroup numbers in both addition and subtraction. And they help illustrate that multiplication is the same as repeated addition, and division the same as repeated subtraction. Packaged in re-sealable poly bag for easy storage. Discs are 1" in diameter, 1/8" thick, and made of EVA foam for easy manipulation and quiet classroom activity. 25 each of 10 values - 0.001, 0.01, 0.1, 1, 10, 100, 1,000, 10,000, 100,000, 1,000,000. 250 total discs in set. 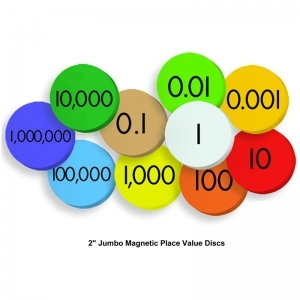 These easy-to-manipulate magnetic discs provide whole group demonstration developing number sense. 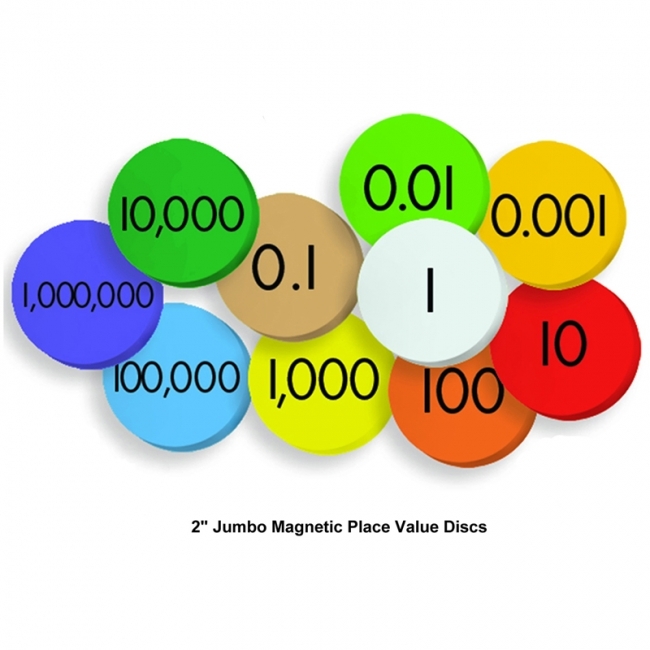 Color-coded according to place value, the magnetic foam discs allow teachers (or students) to demonstrate on any magnetic board while students visually track what happens when numbers regroup in both addition and subtraction. And they help illustrate that multiplication is the same as repeated addition, and division the same as repeated subtraction. Packaged in reusable storage box. Magnetic foam discs are 2" in diameter and made of EVA foam with magnetic backing for easy grip and movement. 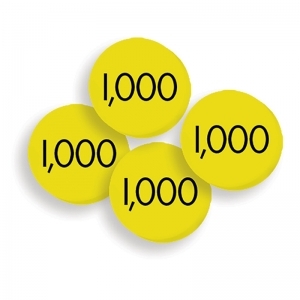 20 each of 7 values— 0.001, 0.01, 0.1, 1, 10, 100, and 1,000. 140 total jumbo magnetic foam discs in set! 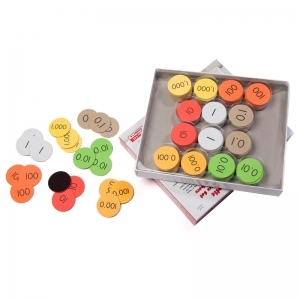 These easy-to-manipulate discs provide hands-on practice for developing number sense. 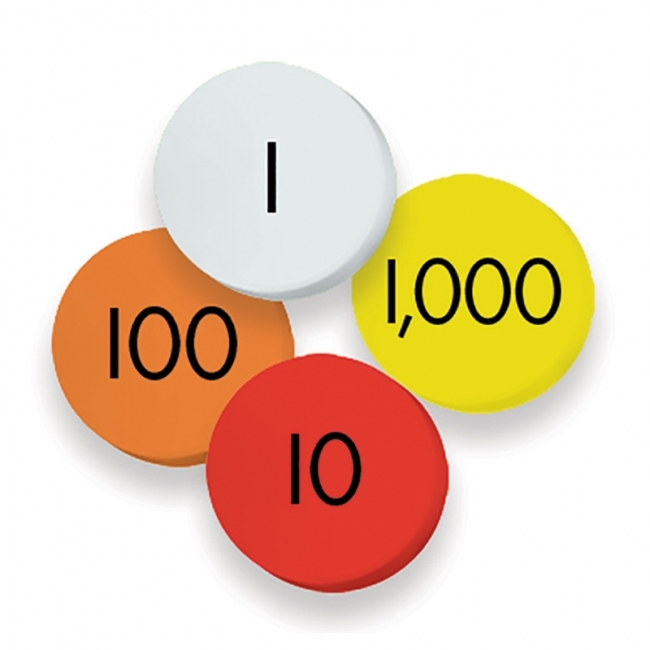 Color-coded according to place value, the foam discs allow students to visually track what happens when they regroup numbers in both addition and subtraction. And they help illustrate that multiplication is the same as repeated addition, and division the same as repeated subtraction. Packaged in re-sealable poly bag for easy storage. Discs are 1" in diameter, 1/8" thick, and made of EVA foam for easy manipulation and quiet classroom activity. 100 each Tens disks. 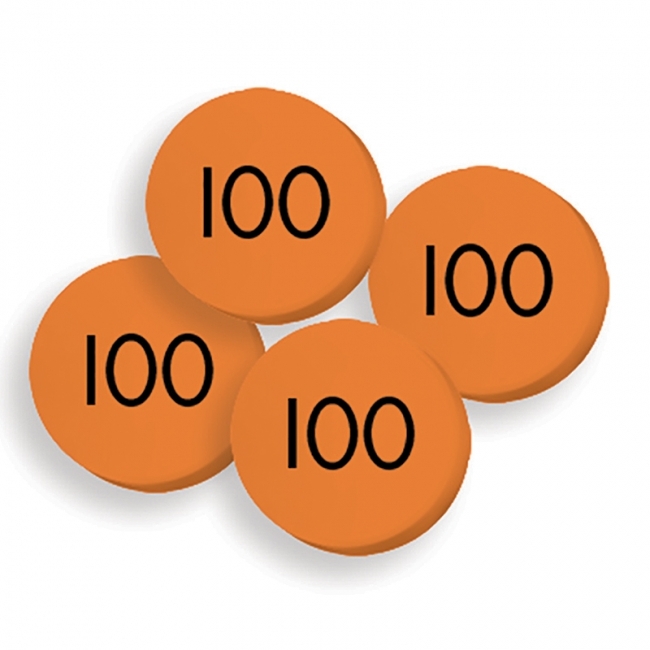 These easy-to-manipulate discs provide hands-on practice for developing number sense. Color-coded according to place value, the foam discs allow students to visually track what happens when they regroup numbers in both addition and subtraction. And they help illustrate that multiplication is the same as repeated addition, and division the same as repeated subtraction. Packaged in re-sealable poly bag for easy storage. Discs are 1" in diameter, 1/8" thick, and made of EVA foam for easy manipulation and quiet classroom activity. 100 each Hundreds disks. These easy-to-manipulate discs provide hands-on practice for developing number sense. 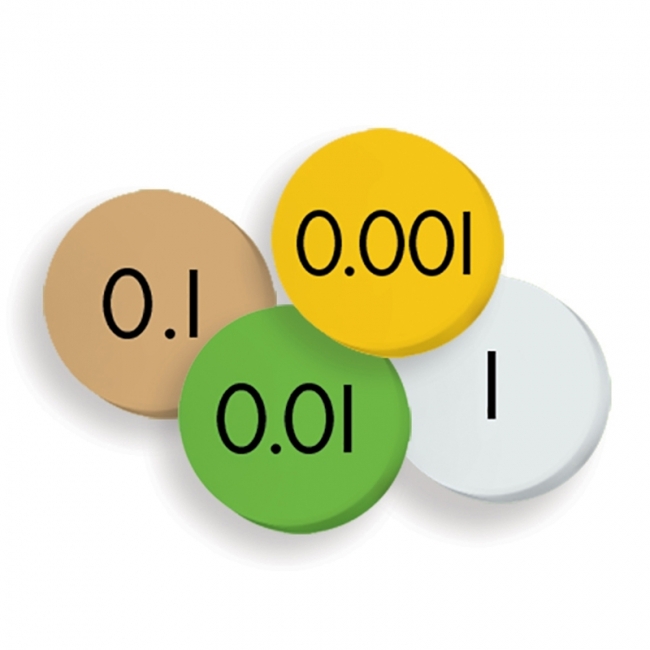 Color-coded according to place value, the foam discs allow students to visually track what happens when they regroup numbers in both addition and subtraction. And they help illustrate that multiplication is the same as repeated addition, and division the same as repeated subtraction. Packaged in re-sealable poly bag for easy storage. Discs are 1" in diameter, 1/8" thick, and made of EVA foam for easy manipulation and quiet classroom activity. Each set includes 100 thousands place value discs.